With the acquision of free agents Ish Smith, Jon Leuer and Boban Marjanovich, the Pistons managed to get even younger. After 44 victories and a trip to the playoffs, the Pistons impressed analysts and fans, who view them as a young, up-and-coming team. With their free-agency moves — point guard Ish Smith, forward Jon Leuer and center Boban Marjanovich — they managed to get younger. 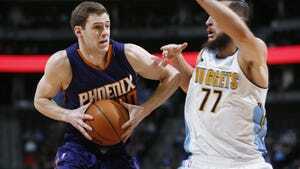 Leuer is 27 years old, and Smith and Marjanovich are 28. They replaced Steve Blake (36), Anthony Tolliver (31) and Joel Anthony (34). Tolliver had been a mentor for Andre Drummond, and Blake was a veteran voice for the point guards. Tolliver also was one of the most respected voices in the locker room, but signed as a free agent with the Kings this summer. Darrun Hilliard, who missed the Summer League with a back injury, appears to be on track to start camp healthy. He’s been participating in light optional workouts, but isn’t doing anything that could cause a setback. Hilliard averaged four points and 1.2 rebounds, shooting 38 percent on 3-pointers in 38 games last season. ... One of the key matchups to watch during camp is for the third point guard position. Lorenzo Brown had a good Summer League, and with his familiarity with the offense, looks to be ahead of Ray McCallum Jr.
Each player is on a non-guaranteed contract.